Bouldering, an off-shoot of rock climbing where the climbers attempt very low-hanging, but very difficult routes, is a surprisingly social one. The routes are so tough that they often require a lot of discussion (routes are even referred to as “problems”). And because they are so close to the padded floor, you are never far from your friends. 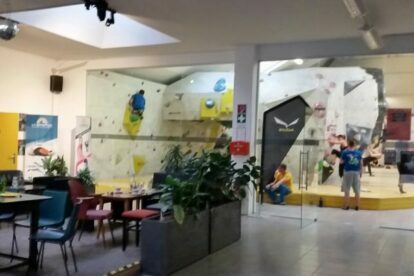 Boulderbar in the 20th district next to Hannovermarkt has capitalized on this effect with the surprisingly simple concept of joining a small bar to the boulder hall. Located in an interior courtyard (“Innenhof”) behind a Turkish supermarket, Boulderbar has seen an unexpected flood of interest, to the extent that they have now purchased over half the available business space in the courtyard. The concept is simple, but the results are excellent. The staff ensures that the routes are always changing so that the climbers stay interested. The beer is cheap and the snacks are decent. There is plenty of seating indoors and out. But the social aspect makes the difference and is what keeps me coming back. Yes, yes, you say, that is all well and good. But is it not counterproductive to drink beer while trying to work out? I am simply not listening to you: would you please let me get back to my climbing and my beer?